Last week my friend Stephanie used my bread recipe and entered it in a gluten free baking contest here in Arizona. It was judged by 3 professional chefs. There was a fifty point scoring system they used to grade the entries. My bread received 49 out of 50 points. Since I wasn’t there (and now I am wishing I had been) I asked Stephanie to do a guest post today on her experience at the competition. Here is what she had to say. This recipe is the million dollar recipe of all gf bread recipes! It is the best bread recipe out there, period! It looks like, smells like, and tastes like real bread. (It even beats Udi’s bread). I don’t know how many times I tell people this and they don’t believe me until they taste it for themselves and then the comments start coming flowing. Things like “Wow” and “Oh my God” and “Finally” are heard by Kim and I repeatedly when we have people try this bread. Sometimes tears are seen. I know I cried when I tasted this bread the first time. Anyone who has Celiac Disease knows the taste of gf bread that you buy in the store. It’s hideous. It tastes like styrofoam. I thought the rest of my life was doomed to a fate of corn tortillas wrapped around hot dogs and no bread when I was diagnosed with CD. That was until I had my first taste of Kim’s bread. Then I knew I would be “normal” once again. To validate and tell the world that this bread is truly the BEST gf bread out there, I did something behind Kim’s back. I entered it in a gf baking competition. It was judged by three professional chefs and guess what? IT WON 1ST PLACE!!!!!!!!!!!!!!! Kim is far too modest about her bread recipe to do this so I did instead! I’m so glad I did! I just wish I had videotaped what the judges had said, because it would’ve brought tears to her eyes to hear what they had said. The judging of the entire competition was meant to be a positive experience for all of us who entered. The judges were instructed not to be negative, only positive with their comments. Yet every dish they tasted they had something to add or to suggest. But not on Kim’s bread. They had nothing to suggest or add. Not one thing! I was astounded! One of the chefs mentioned that he had tried a lot of gf bread in his time and it’s always a disappointment, but not this time. He mentioned that the crust was baked right and didn’t need to be cut off (like some people like to do with bread). All three chefs liked the moistness of the bread and the texture of it. The lady chef was impressed with how versatile the bread could be. Meaning that you could make sandwiches out of it, French toast, regular toast, roll hot dogs up in it, and etc. (because it would hold its shape—which most gf bread will not do). In the end all three chefs basically said they were “so impressed” with the bread. If you haven’t tried this bread yet, you MUST! I’ve been making it for about a year now. It is the best thing ever and I count Kim a bread genius for inventing this recipe. If my comments don’t convince you of this, then let the comments of three professional chefs do it!!!!! Thanks Stephanie. You’re right, I never would have entered that competition. I am glad you did. I am not trying to make money with my blog. What I do want to do is spread the word that gluten free does not have to be tasteless. Making this bread is easy and the combinations of flours can fit just about any taste. I make mine completely rice free which is something you won’t find in a gf loaf you buy at the store. It is made with 2/3 whole grain flours and that is something else you won’t find in a pre-made loaf. Look at the ingredients in all those loaves at the grocery store. You are paying big bucks for little else than rice flour and starch. Here is the original recipe and here is the simplified version. Happy baking! Wow!! Congratulations!! Kim, how many times have I said that bread is nothing short of awesome. Better than a lot of breads that you buy that do have gluten. Thank you, thank you, thank you! This bread is awesome. It tastes and feels like REAL bread (well, u know what I mean). I thought I was doomed to live without that normal bread texture and taste but not anymore. I even used brown rice flour instead of the teff and it is just great! Oh I didn’t have coconut oil either so I used olive oil. I can’t wait to try some variations of this recipe. You are amazing! Amazing? Nah, not really. But I am really happy that you liked it. Having bread that you actually like opens a whole lot of doors that we thought were slammed shut, forever. If you can get your hands on some teff try it. I think it tastes most like wheat. Sorry for the delay. I’ve been crazy busy. Can you sub guar gum for xanthan gum? In a word: No. I just found out that I am allergic to corn. This really stinks on so many levels, let me tell you! Xanthan gum is made from corn so I bought some guar gum. I had mistakenly thought it was a 1:1 substitution. Epic failure. Epic! I really need to write a post on this failure because it was so bad. I took pictures and everything. It was hysterical. The batter was thinner and then it rose really high and fell way way down. The center of the bread was only about an inch thick but there was still bread up the sides and over the top. The top of the loaf which was more like the inside of a bowl was smooth but porous. Werid. It had a terrible texture to it too. It was sort of grainy. So clearly I have a lot to learn about how to use guar gum. I have since learned that you should use more like 1.5 times as much guar gum as xanthan. But I also read that guar gum doesn’t work great in breads but does better in cookies and stuff like that. I have got to get it figured out. I know have 2 bags of guar gum so I need to use them somehow. I am now wondering if I could make it with out any gums but use chia seed and flax seed meals as a binder. That might be another post about more epic failures. Its worth a try. So, if you can have corn/xanthan gum use it. If you can’t your guess is as good as mine. 😉 If you do get it figured out I would really love it if you posted back here so I could try whatever it is you did. This is amazing…..SO SO SO proud of you!!!!! Ok. I admit it. I’m intimidated by lots of flours and alot of ingredients. BUT. Because I think you’re awesome I’ll give it a go. I’m kinda excited. Kinda nervous. Probably won’t be able to do it until the end of the week. That’s Kim, three judges, and me that think so! Congrats Kim. I can vouch for your amazing bread recipe. Loved it. Thanks Leta. I didn’t know you read my blog. Thx for leaving a comment. that was so beautiful Karma to get the first prize, you should be proud….congratulations!!! I just made the simplified version in my hi altitude, dry Calgary weather in “my” Bread machine and it came out beautiful , even my DH commented on the excellent taste ( only thing different was I used arrowroot starch as I could not get to the special health food store that day) . Feels so much better than taking the dough out and letting it rise on the counter which is a battle in my hi altitude,Dry area! .\Other flours I used was Teff and Sorghum. My next try will be with Coconut instead of Sorghum. Kim you said that someone used this combination (or close to) do you know theirs? So happy to hear you are enjoying it. The friend who used coconut flour is out of town right now. I’ll ask her what she does when she gets back and I will post it here when I do. I have never used arrowroot starch. Does it work the same as tapioca or potato starch? Kim, I was so excited about the bread recipe but have tried it twice in the last few days and can’t get my dough to rise…any ideas that could help? Thanks and thanks for all the great recipes! A couple questions. First have you tried proofing your yeast to make sure it is good? Did it rise at all? The water temp wasn’t too hot was it? Sounds like it could be a yeast issue if it isn’t rising at all. Rising and falling or a dense although somewhat risen loaf is another. Second question, where are you located. Apparently that seems to make a big difference. Which flours and starches did you try? Sorry about the delay in response. I’ve been working long days. Let me know those things and I’ll try to help. Bravo! I’m known for my great gf bread, but I baked a loaf of yours today. I do believe you’ve got me beat! Fantastic, light, airy & whole grain goodness. Thank you!!! Wow! Now that is a compliment coming from someone who already makes great GF bread. I am so glad you liked it. That makes me happy! Now I am going to go check out your recipe. I will definitely be making this recipe again, and sharing it too. 🙂 This is the recipe I’ve been using the most up until now. http://www.thebakingbeauties.com/2009/02/another-wonderful-gluten-free-sandwich.html Thanks again! That picture looks like a great loaf. I don’t generally like rice flour however. I don’t even keep any in the house. I wonder how that bread would turn out if you subbed the brown rice flour for teff? Hmmmm might have to play with it. Absolutely SUPERB bread! Even my wheat-eating husband and friends devour it. I’ve used it for sandwiches – it holds up to mayo, lettuce, tomatoes, etc. It’s been a rough day at my house today. Thanks for this. You just made this day a good one. Congratulations on your award winning bread recipe! It looks and sounds wonderful, thank you for posting. I also have a quest to perfect gluten free bread and I’m anxious to try yours. I’ve had luck with my bread tasting good and having good texture, but my challenge is making a loaf that doesn’t weigh 3 lbs…ha! I love Udi’s for the lightness of the loaf and I’ve yet to re-create it while trying tips and variations from other GF Bloggers. Not sure how to remedy this. Would you say your loaf is light (weight-wise)? Even some of the loaves I’ve purchased at Whole Foods that cost $8 a loaf seem to be very heavy. Any thoughts? I know what you mean by a 3lb loaf! My guess is that some of the reason that Udi’s bread is so light is because more of the “flours” they use are white rice flour and starches. There is not a much in the way of whole grains in there. And whole grains are heavy/dense. So yes, my bread is heavier than Udi’s but it’s not a brick. It is still soft and flexible. That said, when I made my bread when I visitied family in Canada the bread was a 3 lb brick. It was dense, brittle and dry. It was hideous. So I think the outcome has a lot to do with the grind of the flour you use. The millet I used in Canada was much more coursely ground. It had almost a fine sand like texture. I wonder if you tweeked the recipe to omit some of the whole grains and replaced it with powdery starches if that would make a lighter end product. We really like my bread as is so I don’t want to remove whole grains and replace them with starch aka sugar. Maybe you could try and let me know how it works out for you! If it works, take pictures!! What do mean by whole grain rice flour. Would this work with egg replacer as my grandchild is also allergic to eggs. Would love to try this recipe as my last three tries with other recipes have been a disaster. We bought unpolished plain brown, red, and wild rice mix (I think there were 8 different grains) and ground it into flour. Honestly, we only did this once because I personally don’t think rice is the best choice. I have never bought brown rice flour but I am pretty sure this would work fine in this recipe. I tend to sub ivory teff for brown rice flour in any recipe just because it has it’s own gluteny texture and it has a better nutritional profile and I think it tastes most like wheat. I have not tried it with egg replacer but I think someone in the comments did use it and they said it worked. I just can’t personally say how well it would work. I wish you luck. We all know how incredibly frustrating it can be to have repeated failures. Please let me know how it worked out for you and what flours you used. Are you in Alberta? Yes we live in Alberta. Just tried your recipe but it did not raise well at all. Just wondering I used guar gum instead of xanthan gum, xanthan gum is so expensive, wish we could buy it in smaller quantities. Could this be part of my problem. It does not look like your loaf at all. I was so excited to try it, but not great results. I used my mixmaster not a bread maker. Oh no, I’m so sorry. I don’t know if guar gum makes a difference. I have never used it. I have heard that they are not equivalent. Xanthan gum is crazy expensive but it never goes bad and if you are going to be baking for years to come you might want to make the investment. I think part of the problem may well be the egg replacer. Of course that doesn’t help you much since you can’t use real eggs. I’m so sorry. I feel your frustration. I wish I could help better. When I was in Alberta this summer (that’s where we are from and our family is still all there) I tried to make my own bread recipe. It was a train wreck. I didn’t have the time to play with it to get it figured out. Next time I go I will do that but of course that doesn’t help you at all right now. I wish you the best of luck in finding a bread recipe that works for you and your grandchild. Kim, just wondering if all those eggs were necessary. Just trying to find a way out. I won’t give up. I think the eggs are nessessary to get the right texture. I think it would be crumbly and dry without them as well as having no rise. Try googling vegan gluten free bread. Maybe you will get a recipe that wasn’t meant to have eggs. How about this one? http://thecinnamonquill.com/blog/?p=866 It looks good. I’m thinking the texture looks a bit crumbly but it is worth a try, maybe? Or try my recipe minus the eggs. Maybe try subbing with “flax goo” (ground flax seeds with warm water and let to sit can often work as an egg replacer) and maybe adding a bit more oil…. I’m looking closer at the cinnamon quill recipe and it looks really similar to mine. Maybe this one really could work! Hi Kim, just tried your recipe again with a few changes. I proofed the yeast, used the flax seed and water in place of one egg and 2 tsps. vinegar for another (I understand people used to do that a long time ago when they were short of eggs) increased the oil by 1 tbsp. And guess what, it rose nicely, but is a little dense. But certainly the best so far. It tastes great. What’s this I read about putting it in two loaf pans? Do you mean the 9×5 or smaller? Wouldn’t it be more like a pancake? By the way, I beat my flax seed mixture after cooling as per Gluten Training. I’m very excited, do you have suggestions regarding the denseness, maybe a little airier. Thank you for your help. I am super impressed at your success. I really didn’t think that it could turn out without eggs. If you get this perfected maybe you could send me pictures and I will post your changes, giving you credit of course. I use the size smaller than the 9×5 maybe 8×4. I bake it for 28 minutes at 350. I have three ideas in making it less dense. 1) Let is rise for one hour. That’t what I’ve been doing. 2) If you are using a stand mixer try letting it mix longer than you have been. I noticed today that when it mixes longer the batter feels smoother and turns a lighter color. 3)Try replacing 1/4 cup of flour with more starch. I’ve never heard of the vinegar trick. Very cool! Kim, would it be a bit airier it I let it rise a little longer? I let it rise about 45 min. and used 1T yeast. What is the reason for the pan of water in the oven. I do use 1 T of yeast. Rise of one hour. The pan of water in the oven: It’s my understanding that it is done to make the crust crispier and help it to not crack. I don’t personally use that technique though. I should try it sometime to see if there is a real difference. Have you tried it? I will contact my friend that entered my bread in the GF baking contest and see if she can remember how the point system worked. I will email you when I get that info from her. I bought a new bread machine excited to try the recipe, through the window it looked beautiful, but when it was finished, I went to get it out to find that the top caved in. Pretty infuriating isn’t it?! I stopped using my bread machine because of this. I now do it in the oven in 2 small loaf pans per batch. I left a reply on your other comment with a possible solution. Also, on my bread machine, I have preheat which I did not use per your instructions. I have 1 knead cycle which I used 20 minutes, you use 2. I have 3 rise cycles, which I just found the first rise is at 82.4 degrees as well as the second but the third rise is at 100.4 degrees. I used rise1 for 60 minutes. Mine bakes from 254 – 290 and I cannot adjust the temp. If anyone can give me a hand, I would appreciate it!! Can you increase the cook time? Try adding 5 minutes and see if that helps. I now believe that the biggest factor in the caved top is cooking time. You have to play with it to find the balance between cooking it long enough to create a firmer crust that won’t cave and over cooking it and creating a loaf that is dry like the store bought ones. Good luck! I’ve just come across your blog and I’m keeping my fingers crossed that THIS attempt at gluten-free bread will be a success. Like many of the posts, rising seems to be the biggest issue with prior attempts, although the texture of the last bread turned out quite well. Even my wheat-eating, trying to change his habits husband approved – :). I note that you no longer use a bread machine but that’s really the way I want to go, especially with the cost of electricity & peak pricing here in(Canada) and the hot summer days. So I have a question about Brown Rice Flour and Rice Bran flour. Are they interchangeable? Is one heavier than the other so that I’d have to modify other ingredients? I didn’t know that xanthan gum was corn based. You provide so much additional info that it’s like you’re my gluten-free guru!!! I’ll be making the bread tomorrow (30th) so we’ll see what happens. Thank you for your time, energy and dedication to this site. Hmmmm, so much for being a gf guru…I’ve never even heard of rice bran flour. And if that’s not bad enough, I’ve never used brown rice flour. Sheesh, I’m no help at all. Maybe someone else can chime in. I live in Arizona but I am from Alberta. For whatever reason I could not make my bread rise there. It seemed like the flours were coarser there than here. I don’t know. At any rate, good luck tomorrow and please let me know how it turns out for you and what you decided to use. Debra here… all I can do is LOL! What a dismal failure. Nice taste, little rise (3 in”), dense texture. Agh! Undaunted, I shall try again tomorrow. Could you tell me exactly what is ‘proofing your yeast’? If the jar states it’s good until the next year, shouldn’t this be an indicator of its freshness? And would the bread work if I tried a ‘fast-rising’ yeast? I’m wondering if she just needs a boost? I was too ashamed to take a picture of her, she was embarrassed enough poor thing – 🙂 – C’est la vie! Hello Kim – I made the loaf again, using Fast Rising Yeast – and – checking your ingredients/instructions to make sure I hadn’t missed anything. I’m embarrassed to say that I completely missed the 3T of brown sugar on the 1st attempt. (How did I miss that one?!) AND – I was very diligent about liquid temps. The bottle of FRYeast says 100 degrees, so I mixed up my room temp eggs, coconut oil (which I use all the time by the way) and almond milk and heated them all together until 102 degrees because the bread maker pan was cool to the touch and I factored in the adding time to for the ‘flours’. I was so excited when I saw it rising that I mistakenly opened the breadmaker just to ‘touch’ it to make sure it was really happening, that it fell a bit, but it was still a great success and the next one will be perfect as I won’t be so nosey. I’m also going to take out the beaters once it’s finished mixing so we don’t have those terrible gaps in the loaf. I’d like to send you the picture but I don’t see where on your site I can do so. Let me know and I’ll send you my beauty!! I’m so sorry for the delay. I’m on vacation and have spotty internet. I’m so glad you got it figured out and had success. I would love love love to see a picture. If you click on the little facebook tag (yes, you need to have a fb acct) and click “like” you can post a picture on the wall for everyone to see. I’d really love to see it. Which flours did you use? Where are you located? I always wonder about this as I think where you live will somewhat determine how it comes out. Anyway, please post a pic for all to see on the fb page! Oh, you’re from Ontario… forgot. Cool that you got it to work. Did you use that rice bran flour? Hi Kim: Don’t be concerned about getting back to me, we all realize that this spot is NOT your life – or we should! I sent you the pic to your gmail account. Let me know if you got it. I don’t like FB so won’t be going there. As far as ingredients I used EXACTLY what you specified in your original recipe (i.e buckwheat, quinoa, brown rice flour etc.) sifted the flours and used maple syrup instead of the honey. I needed a success so didn’t want to chance the rice bran flour. I made another loaf today – without peeking and it rose a little higher but then it fell in the middle. I’ve sent a pic to your gmail account again. Any ideas why it fell? And also, I think my breadmaker cycle is too long. It still had 20 minutes to go but the bread was quite brown and had it on the lightest cycle. I took an internal temperature and it was 200F so figured it was done. Is there a rule of thumb about cooked bread temp. that I can go by? I just made this bread last night. My whole family enjoyed it. Thank you so much! I didn’t have tapioca flour, but used potato flour. still, much better than the g-free udi’s. Thanks so much for taking the time to let me know how it turned out for you. I’m glad you liked it. I like Udi’s in a pinch like when traveling but it’s so dry and expensive I can’t imagine buying it on a regular basis. We too think this bread is so much better. Just got my bread maker and have my flours, trying my first go at it in the am. Fingers crossed! My bread maker doesn’t have a gf setting so I’m trying the regular one. Hope it turns out! Very exciting! Good luck. Let me know how it turns out. Turned out amazing! My super picky eater has eaten it every day since I made it! So happy! Making another loaf or two tomorrow. Thanks a ton and I love the simple recipe. I am NOT a baker, this has changed my life and will save is money. Oh, and I made your cabbage rolls and my husband called it a special meal we must have often! Yum, so gladi found your blog. I’m jealous of all you that can have yeast. We have yeast allergies at our home so I was wondering if you have any recommendations on a yeast substitute? I’d love to try your bread recipe, especially the breadmaker version but don’t know what to do about the yeast issue?? How about trying a sour dough recipe. I’ve never done it but one of the commenters here used this recipe as a starting point and made gf sour dough bread. I can’t help you since I’ve never done it myself. Sorry. Try googling it. Good luck! I’m not going to say anything different than most of the previous people and I’ll say it in the same way, too. But I gotta let you know that I tried this recipe for the first time, not in a bread maker but the ‘regular’ way. I beat the dough with my bread hook attachment, let it rise in a warm oven for an hour/till doubled, then baked. It turned out GREAT! The very first time! And the taste was yummy!! Now the true test will come tomorrow. Will it be dry? Board-like? Crumbly? We shall see. But for now…perfection! OMW!!!!!!! Thank you, Thank you, Thank you!!!!!!!! I just found this site a couple of weeks ago and ordered me some Teff flour thereafter. It arrived this week, and I just made my first loaf. It is AMAZING!!!!!!!!!! I have tried loaf after loaf of GF bread recipes and NONE of them come even close to being this heavenly!! I have resorted to UDI’s, but it is so expensive, and only makes a good grilled sandwich, in my opinion. Your recipe is a HUGE BLESSING!!!!!!!!! I even made a brownie recipe with the Teff flour, and I can’t tell you how wonderful they are!!!!! Simply delicious!!!! This recipe and flour is an answer to my woe’s of GF bread baking!!!!!! I’m so happy you enjoyed it so much. And I greatly appreciate you taking the time to tell me so. My favorite flour is teff too. There is a dark and an ivory variety. I prefer the ivory as it is much milder. 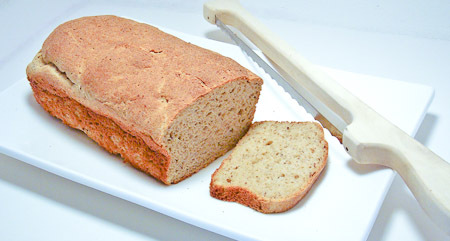 Although using the teff in bread and adding some caraway seeds might mimic a great rye loaf. Congrats on your gf baking successes. I will try this recipe. Before having the gluten intolerance, I used to bake my own bread, cakes et cetera. All the bread I’ve tried have a weird after taste except for Udi’s. If you have a corn allergy what can you use in place of the xanthan gum?? Well there is guar gum. I too was diagnosed with a corn allergy and tried to make this bread with gg. It was hands down the worst flop ever. I even had to take a picture of it. It was funny. So in theory one cod use gg. I know now that the conversion is not one to one. I never tried after that so I can’t help you much with figuring that out. Sorry. Absolutely loved this bread!!!! I made it first without the teff flour and it turned just ok. Bought teff flour and omg, what a difference. It was the lightest, airiest ( if that’s a word) bread I have had since going gf 4 years ago. Thank you so much, just curious which flours make the best loaf? I used sorghum, buckwheat, teff, tapioca flour. It was really dark in color but delicious. I’m so glad you enjoyed it. My favorite blend is ivory teff (which is the lighter version of what you used), millet and tapioca. Getting the flours in the finest grind you can is key. This recipe sounds great. I can’t wait to try it. Only have one question….which setting do you use, light, med or dark? It’s been a really long time since I used a bread maker for this. I think we used it on the medium setting. Each bread machine may vary too. Start there. If it falls a lot in the center try the dark setting next time. Just baked a loaf, smells fantastic.! Can’t wait to try it. Thanks for writing to ask for help. Sorry I have taken so long to respond. That mix of flours should be just fine. 1 – What did the batter look like before you added more liquid? It should look like a thick sticky muffin batter. Maybe a little drier. 2 – What did your flours feel like? Were they powdery and fine or a bit more coarse and grainy? I have tried to make this when I am back home in Alberta and it turns out like a nasty brick every time. I have decided that it may well have to do with the flours available to me there. They are more coarse than what I use here in AZ. 3- Let it rise as long as it takes to nearly double in size. You may have to adjust your bread maker settings to do that. 4- Maybe most importantly, if you can’t make this work in your bread maker, then do it in 2 loaf pans in your oven. I have listed oven recipes on either this recipe or the simplified version. Sorry I don’t have time to look right now. I got rid of my bread maker because I can consistently make better looking loaves in the oven. It is not harder to do this that way. 5- One last idea. Try using bottled water as your liquid. I’ve hear reports of chlorinated tap water killing yeast and creating dense bread. I don’t know this for a fact. Just might be worth trying. Hope this helps. Please don’t hesitate to ask if you have more questions. Hi Kim, I am in Calgary Alberta and made your bread by hand and it turned out PERFECTLY!!! I used quick rise yeast, and put the oven on 200 degrees and let the bread rise in the oven. My husband LOVES your bread and it is single handedly the staple of our GF diet. Many many thanks! Have you thought about putting out a recipe book? You should check out Kickstarter or Indiegogo. I would definitely contribute to a campaign to get your GF cookbook launched! Great pictures and recipe. Thank you!!! You’re sweet. Thanks. I am not planning todo a cookbook. I have my hands full with other projects. I have a hard time keeping up with the comments here. Lol. It so good to hear that you have had luck in Calgary. I have had brick like results when I make this in Edmonton. Thanks Kim, I have since found that by adding gelatin and a bit of gf baking powder my bread turns out great !! Hi Kim, Thank you for sharing your recipe with everyone.I have a question and would be grateful if you could guide me. My boyfriend recently developed gluten intolerance and tried to find a Gluten-Free bread for him, so I tried couple of G-free recipes in my breadmacker (including your recipe, and the one suggest by my bread machine). All results turned out looking great (high rise, beautiful texture etc.) but they had “AWFUL” taste and smell! I just had to throw them out! Though I had bought and tasted prepared G-free bread (like Udi’s white sandwich bread) and I thought they tastes wonderful to me! So I was wondering what is the matter with this awful result that I get!!? all my ingredients are Bob’s Red Mill and I tasted them in my mouth to see if I can realize which ingredient has that bad taste?!! The only thing I could think of was this: I used “Whole Grain Brown Rice Flour”, but in all recipes the rice flour isn’t “whole grain”. Could this be the problem? Have you ever tried Whole Grain Rice Flour? I would appreciate if you could help me with this issue. You can get teff from Teffco.com!! That’s where I get mine from! That stuff is the best!! I’ve baked many a GF breads in the last 5 years but this is THE BEST recipe I’ve ever followed! Thank you!! That’s great! Thanks for taking the time to let me know. Happy baking!! can I use this recipe as a dinner roll? Yes. I have done that both by using a muffin tin and by coating my hands in oil and forming balls. The dough is not like wheat bread. It’s more like muffin batter so it’s a messy process but it can be done. I don’t remember bake times tho. Sorry. I came across your recipe a few weeks ago. Last evening I laid out all the ingredients called for in your recipe, including the eggs so everything would be room temperature later this morning. Dry ingredients all sifted. I heated the water much warmer than usually called for, but trusted you were right. I used my upright Kitchen Aid as my older model West Bend bread maker has a paddle that cannot be removed. I usually overheat the water to compensate for fridge cold eggs. I don’t wait for everything to come to room temperature. I hope it works out for you. Please let me know. the picture. But I couldn’t get it out of the pan, Used a knife and a spatula. The next time I will line the bottom of the pan with parchment paper. Also will wait out the 40 minutes for rising. Had my first sandwich in several years, today. Many thanks for sharing. Will this work for hamburg buns? pizza? Yay! I’m so glad it worked out for you. I coat my pans in coconut oil then line them with wax paper and trim the edges so they don’t come up way over the edge. Then the bread literally falls out of the pan. I wait for the bread to cool then store in the wax paper (and plastic bag) and peel it off as needed. I find the wax paper is easier to deal with than parchment paper because it isn’t so stiff. It will lay pretty easily against the sides of the pan. Yes, this does do rolls. You can either coat your hands in oil and form the balls onto a pan lined with parchment paper or you can pipe it. Baking time depends on how many you make. 15-20 minutes. Just watch for them to get to the right color. I have never used this recipe for pizza crust but I believe that others have and have done it with great success. I use this recipe for pizza crust.https://gfrealfood.com/2010/09/08/pizza-crust/ It is quick and easy and doesn’t require waiting for it to rise. However it is a thin dense, cheesy crust not a light fluffy bread crust like this may make. First, congrats! Seconds this looks amazing can’t wait to try it out. Just a few questions, I am actually allergic to rice flour and potatoes and hence can’t use potato starch what can I substitute for that? For example can I use xanthan gum, or psyllium husk or more flax instead of that? In addition if I just use to types of flours (buckwheat and amaranth) and follow the recipe (a long with my potato starch substitute) will i hopefully get a successful airy/fluffy loaf? Thank you so much for sharing this recipe. I’m currently on my last week of a 4 week anti inflammatory diet that included cutting out wheat. I tried a GF artisan style bread earlier this week that was a bust. Wanted to try the Teff flour that I bought so read your post with interest. Used the GF cycle on my Breville Custom loaf bread machine (has 3 rise cycles), medium crust browning setting and guesstimated a 2 lb loaf size. Flour combinations used were Teff, sorghum, buckwheat, tapioca and corn starch. The bread is absolutely delicious. Very, very light texture. After making do with $8 store bought cardboard like GF bread for 3+ weeks, this bread is heavenly. Will definitively be making this one again.